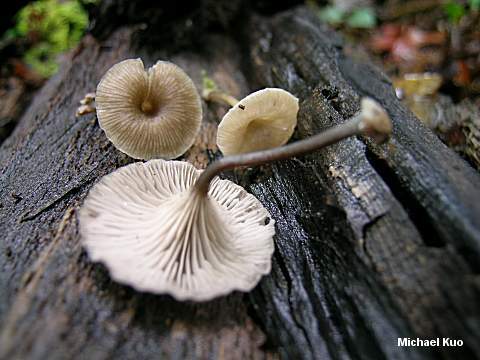 Omphalina epichysium can be found on dead logs across North America. 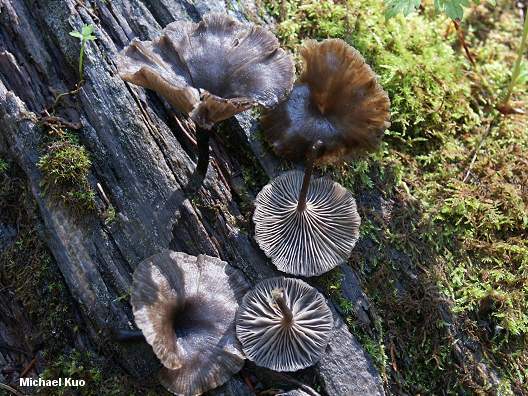 It has a black to dark grayish brown cap that fades markedly as it dries out, and can reach widths of 4-5 cm (which is "large" for an Omphalina). It lacks a distinctive odor, and has broadly elliptical spores measuring 7-9 x 4-5 µ. 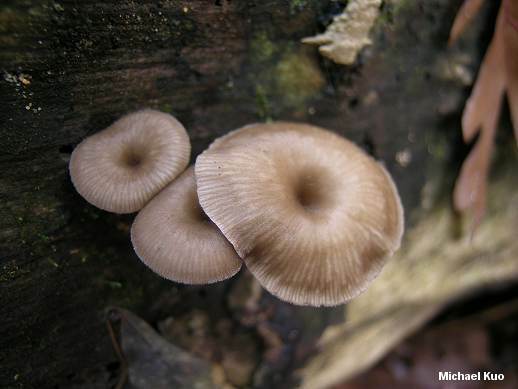 Like other omphalinoid mushrooms, it has a belly-button cap and gills that run down the stem. 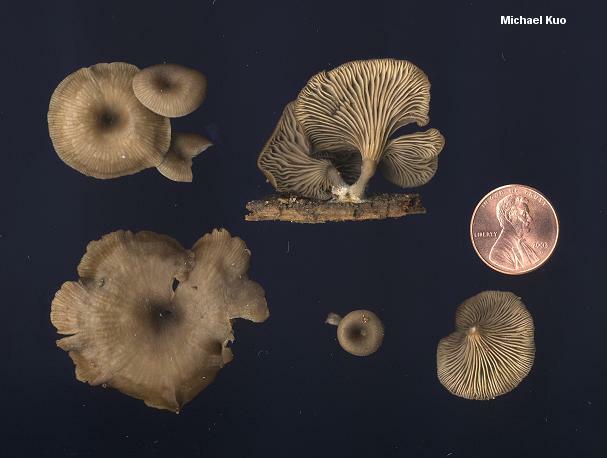 Although it is found on dead wood, it is likely that Omphalina epichysium is associated with moss; careful inspection usually results in the discovery of moss (sometimes craftily creeping through cracks or feebly following fissures) in the immediate vicinity. Clitocybe epichysium and Arrhenia epichysium are synonyms. Ecology: Possibly saprobic but apparently involved in some sort of mutualism with moss; growing alone, gregariously, or in clusters on the dead wood of hardwoods and conifers; spring through fall; widely distributed in North America. Cap: 1.5-5 cm across; planoconvex at first, becoming centrally depressed or vase-shaped; fairly smooth; the margin inrolled at first and later lined, often nearly to the center; blackish to dark grayish brown, fading markedly as it dries out and eventually pale grayish brown. Gills: Running down the stem; close or nearly distant; pale gray. Stem: Up to 3 cm long and 3 mm thick; more or less equal; dry; smooth or minutely hairy; colored like the cap but not fading as quickly. Microscopic Features: Spores 7-9 x 4-5 µ; smooth; elliptical; inamyloid. Cystidia absent. Clamp connections present. REFERENCES: (Persoon, 1794) Quélet, 1886. (Fries, 1821; Saccardo, 1887; Kauffman, 1918; Moser, 1983; Bigelow, 1985; McNeil, 2006.) Herb. Kuo 08140304, 10010417, 10290405.